Wait for it ………. All in stock and ready to ship TODAY ( we are shocked as you are) is the new Eskimo edition They’ve pulled the rabbit out of the hat by revealing in full their collaboration with Thai artist Alex Face! Yes, Mighty Jaxx brings Alex Face’s art into an art collectable to kick off 2019. Released today is the new Eskimo edition. Winter is coming, and Baby Rabbit is ready! 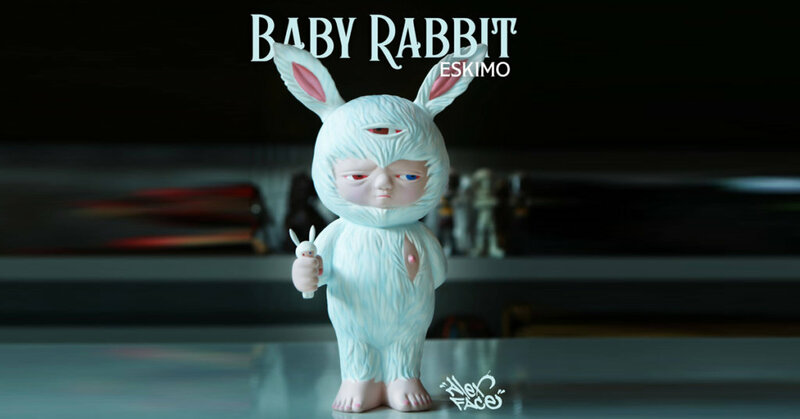 Introducing the latest colourway of the highly sought after toy designed by Thai street-artist Alex Face, Baby Rabbit (Eskimo Edition)! Baby Rabbit represents peace and contemplation in a world of chaos. Baby Rabbit looks cute at first glance, but it won’t take long before you notice the worried look in his eyes. Blushes of pink and icy baby blue add a cool new touch to this iconic design. Subtle painted effects on its fur creates extra dimension for Baby Rabbit’s fluffy coat, making this piece a unique work of art. The character’s name is Mardi, which in Thai means “To come with good things”, and his creation was inspired by the daughter of Alex Face himself. In an interview, Alex described, “The first time I saw her she looked angry or worried”. It made him think about why she looked like that and caused him to reflect on the life she had ahead. “I thought are you not happy to be my daughter? Are you not happy to be in the world?”. These are hard-hitting questions for not only the artist, then a restless young father with an uncertain future, but also for every one of us. Perhaps Mardi helps us peer a little deeper into our own souls to find the truth that we all seek in our hearts. Find Alex Face on Instagram.